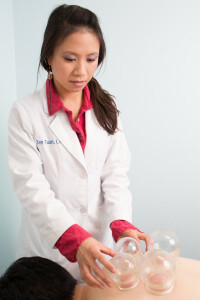 Healing with Zen | Acupuncture & Herbal Remedies | Pasadena, CA » Blog » What the Heck is “Cupping”, Anyway? What the Heck is “Cupping”, Anyway? “Cupping” may sound strange, but practitioners of traditional Chinese medicine have healed people with this method since 300AD (4). According to Dr. Kaleem Ullah, secretary of the British Cupping Society, “Cupping Therapy is an ancient medical treatment that relies upon creating a local suction to mobilize blood flow in order to promote healing” (3). Cupping can provide relief for migraines, muscular tension, respiratory diseases, digestive diseases, and chronic pain, among other conditions. In Ge Hong’s A Handbook of Prescriptions for Emergencies, the earliest recorded mention of cupping from the early fourth century, a hollowed-out horn was the recommended tool of choice. A lot has changed since this technique’s inception; modern practitioners use glass, bamboo, and pottery cups to create the healing suction. 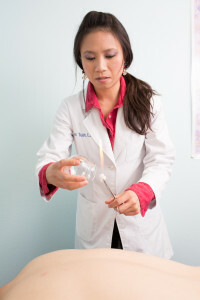 During a typical session, a cotton ball soaked in alcohol is burned inside the cup, removing all oxygen and creating a vacuum that anchors the cup to the skin. Other methods are also used to create suction, such as holding the cup over a small flame and using a hand pump instead of fire. Flame is never used near the skin, only to create suction. Once the cups are placed on the proper areas of the body, the cups are slid across oiled skin. The effect is much like a “reverse massage”; skin and superficial muscle are gently pulled into the cup, which loosens muscles and encourages better blood flow, among other positive effects. According to the Pacific College of Oriental Medicine, “Cupping is one of the best deep-tissue therapies available. It is thought to affect tissues up to four inches deep from the external skin. Toxins can be released, blockages can be cleared, and veins and arteries can be refreshed within these four inches of affected material” (4). The cups are placed along the meridians of the body to target specific maladies, like in acupuncture, which is often administered alongside the cupping procedure. 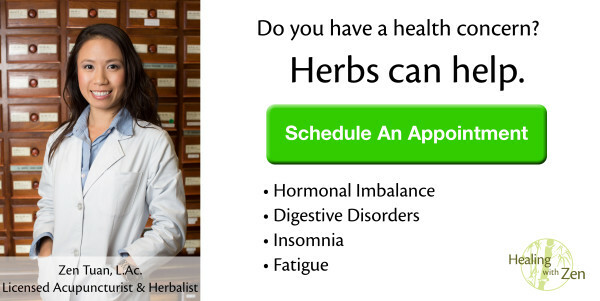 If you experience chronic conditions that keep you from living your best, there’s only health to gain by trying this non-invasive, low-risk treatment. Sources: 1. Dharmananda, Subhuti, Ph.D. Institute for Traditional Medicine, “Cupping.” Last modified March 1999. Accessed February 3, 2014. http://www.itmonline.org/arts/cupping.htm. 2. Ullah, Kaleem, Ph.D. British Cupping Society, “A Brief Overview of Cupping Therapy.” Last modified May 15, 2011. Accessed February 3, 2014.http://www.britishcuppingsociety.org/http:/www.britishcuppingsociety.org/a-brief-overview-of-cupping-therapy. 4. Pacific College of Oriental Medicine, “The Many Benefits of Chinese Cupping.” Lastmodified June 17, 2009. 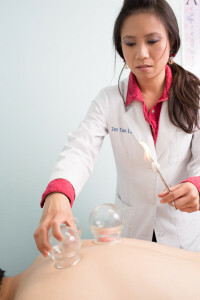 Accessed February 3, 2014. http://www.pacificcollege.edu/acupuncture-massage-news/articles/677-the-many-benefits-of-chinese-cupping.html.